Woodlawn: Mount Vernon's Sister Estate ~ The History Girl! On February 22, 1799, George Washington celebrated his sixty-seventh birthday. There was another reason to celebrate that day, as it was his nephew, Major Lawrence Lewis and Eleanor “Nelly” Parke Custis, Martha Washington’s granddaughter's, wedding day. As their wedding present, Washington gifted the newlywed couple 2,000 acres of his Mount Vernon estate for them to live on. Upon his death, which would occur later that year, the property would be transferred to them. Eleanor had been raised on the Mount Vernon estate as a part of the First Family. 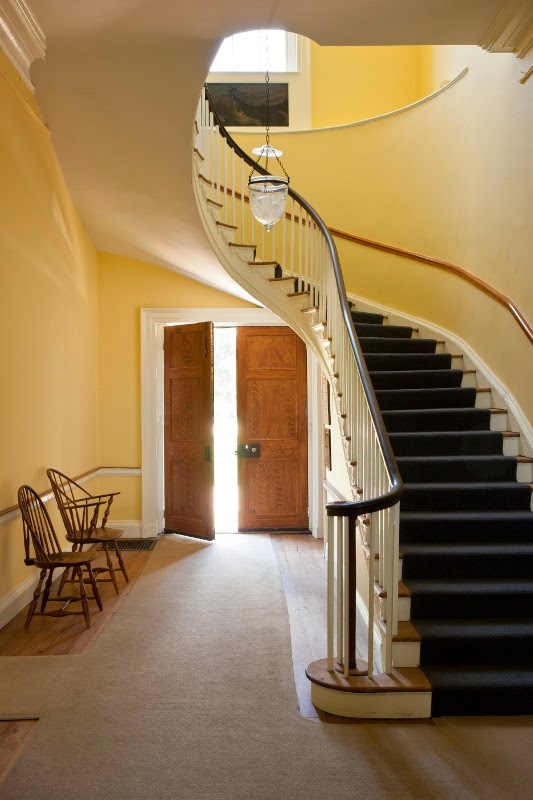 Because of this, George and Martha wanted to keep her close to the family at Mount Vernon. The estate was built on a site selected by Washington, which was part of his Dogue Run Farm. From the ridge of the hill where Woodlawn would be built, Mount Vernon could be seen approximately three miles away. It was designed by Dr. William Thornton, architect of the U.S. Capitol. Construction of the home, a mixture of Georgian and Federal style architecture, began in 1800. The Lewises remained at Mount Vernon until 1802, the year of Martha Washington's death. The young couple and their daughter Parke moved into the only part of Woodlawn that was ready for occupancy, the north wing. The house was completed in 1805. Symmetrical in design, the house was composed of a five bay main block, an open hyphen (passageway) on each side of the main block, and two smaller dependencies on either side, one of which served as a kitchen. This symmetrical setup closely resembles Mount Vernon, except the hyphens at Woodlawn were enclosed and enlarged during later ownership. Unlike Mount Vernon, Woodlawn was constructed of brick and topped off with a jerkinhead roof, On each side of the house were matching square outbuildings; a meat house (smokehouse) and a dairy. A six-sided privy was the furthest outbuilding from the house along the symmetrical line along the ridge from which the house resides. Research indicates a second matching privy would have existed north of the meat house. 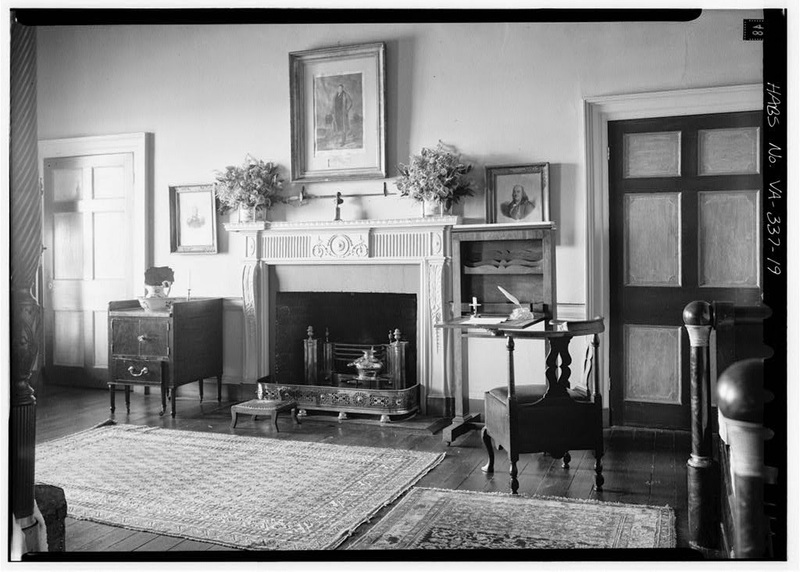 Formal Parlor at Woodlawn. Photo by Gordon Beall. During the Lewis ownership, the mansion was an important social center and visited by Marquis de Lafayette, Robert E. Lee, President Andrew Jackson, and other notables. Diaries from the period indicate that visitors would go to the second floor and use a telescope to view Mount Vernon. Woodlawn remained in the Lewis family until 1846. Lawrence died in 1839. After his death, his widow lived with her son Lorenzo and his family at Audley Plantation in Clarke County, Virginia. The large estate was a burden to maintain and in 1840, Lorenzo took out newspaper ads in order to sell the property. After six years, the property was sold for $25,000 to the lumber firm of Troth-Gillingham. The Troths and Gillinghams were Quakers from New Jersey, who supplied timber to Philadelphia shipbuilders. Their plan for Woodlawn was two-fold. In addition to harvesting the old-growth white oak hardwoods, they sought, as Quakers, to establish a free-labor economy and demonstrate that land could be farmed without the use of slave labor. The Troths and Gillinghams divided the original estate into smaller parcels and sold them to other Quakers, like-minded Baptists, and free blacks. Many of the slaves freed by Washington had settled in the area surrounding Woodlawn. which benefitted the Thorths and Gillinghams efforts. Paul Hillman Troth and his family lived in Woodlawn, which was reduced to 546 acres and the Washington grist mill. The Torths established the Alexandria Monthly Meeting and a school in the house. In 1853, the meeting built a new meeting house, today located near the main entrance to Woodlawn off of Route 1. During the Troth's ownership, the house was restored after six years of vacancy but no major structural changes were made. From 1851 to 1892, the mansion was owned by John Mason of New Hampshire. During his ownership, it became a pro-union center of free labor, education and scientific farming. After Mason's death in 1888, the property was sold to the Land and River Improvement Company of New Alexandria. The company planned to construct a trolley line to connect Woodlawn, Mount Vernon, and Alexandria. Their plans for the trolley derailed after a hurricane severely damaged Woodlawn in 1896 and the company was unable to attract the investors needed to complete the project. New York Playwright Paul Kester rescued Woodlawn and its sixty-five acres in 1901. The damage from the hurricane had not been repaired and the house was in poor condition. Kester attempted to restore the center block and raised and enlarged the wings. During this renovation to the house, the walls of the hyphens were raised from one story to two, the orientation of the portico steps were switched from side to front, the orientation of the dormer windows on the wings were changed, the fireplaces and chimney was eliminated from the south wing, and fireplaces and chimneys were added to the hyphens. Kester purchased Otis Mason's (John Mason's son) adjacent sixty-one acre farm in 1902. In 1905, Kester sold the property and purchased nearby Gunston Hall. Center Hall and floating staircase at Woodlawn. Photo by Gordon Beall. Coal heiress Elizabeth Sharpe purchased the property in 1905. She purchased additional property, expanding Woodlawn to 165 acres. She also continued the renovations that Kester began. Under the guidance of architect Edward W. Donn, Jr., she rebuilt the wings and hyphens using fabric from the original wings and brick and detail acquired from homes in Alexandria, Fredericksburg, and the 1907 Jamestown Exposition, extended and deepened the cellar, installed new floors over the original ones on the second floor, installed new joists and framing in parts of the first floor, replaced all the plaster on the second floor and some on the first, added indoor plumbing and electricity, dug a new well, and added porticos at the north and south ends of the house. Sharpe died in 1924, and in 1925, her heirs sold Woodlawn to its last private owners, Senator and Mrs. Oscar Underwood. 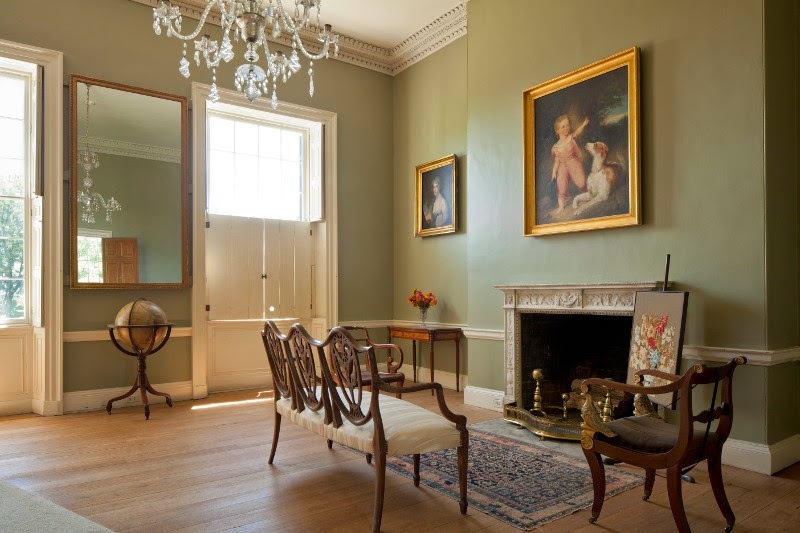 During the Underwood ownership, they continued renovating the house by finishing the dining room in the south hyphen, the ballroom in the north hyphen, and an office in the north wing. This design work was undertaken by architect Waddy B. Wood. The house remained in Underwood ownership to 1948 when it was planned to be sold to the Immaculate Heart of Mary Mission Society, a Belgian order. Proclaiming that the house should remain in the ownership of the United States, the newly-formed Woodlawn Public Foundation protested and purchased the site, which was now 126 acres. The meat house at Woodlawn, Alexandria, Virginia. In 1949, Woodlawn opened for tours through the Woodlawn Public Foundation. The foundation struggled to operate the property and made very few changes. In 1951, the foundation leased the property to the National Trust for Historic Preservation. The property reopened on May 9, 1952 under the leadership of the National Trust. Woodlawn has the distinction of being the Trust’s first historic house museum. Six years later, in 1957, the Trust bought the property and has continued operating it as a historic house museum. Today Woodlawn's property is 126 acres and includes the original house, a meat house, dairy, privy, gardens, and the relocated Frank Lloyd Wright Pope-Leighey House. The property was listed on the National Register of Historic Places in 1970 and designated a U.S. National Historic Landmark in 1998. In a unique partnership, The Arcadia Center for Sustainable Food and Agriculture is now farming portions of Woodlawn and in 2011 the first harvest in more than 100 years were sold in local markets. Can you tell me what the roof cover is? Is that a slate roof?